In 2013 Curious City took on a high-minded question from Minneapolis resident Andrew Wambach. The last supertall skyscraper in Chicago was the Trump Tower, built in 2009. Before that the city hadn’t reached such heights since 1990’s Two Prudential Plaza, 16 years after the Willis (Sears) Tower became the world’s tallest building. While the U.S. may be the birthplace of the form, for a while skyscraper construction had slowed at home — and soared abroad. But that may be changing. In December 2014 Chicago Mayor Rahm Emanuel touted plans for a new tower in the Lakeshore East neighborhood that — if all goes according to plan — could reach 1,150 feet into the air by 2018. In 2013, New York City’s One World Trade Center became the tallest building in the Western Hemisphere, at 1,776 feet. Even Wambach’s Minneapolis had been considering a proposal to construct an 80-story skyscraper. That project, rejected by the city, would have been the state&apos;s tallest building, but would have been just shy of meeting supertall status. Wherever they are, massive developments are difficult to design and build. But when they do happen, it’s generally because two important factors came together to make building up pay off: egos and economics. But first, just how tall is that? Andrew didn’t know this when he asked the question, but “supertall” is an objective term. Chicago’s own Council on Tall Buildings and Urban Habitat is the authority on such matters. 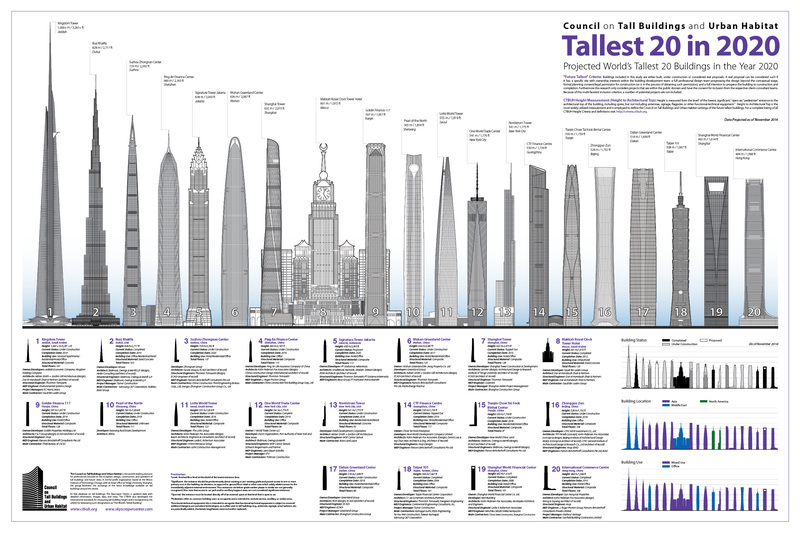 They deem any building over 300 meters, or 984 feet, “supertall.” (For a rough measurement, that’s about 75 stories.) Six buildings in Chicago qualify: The Trump Tower, Willis Tower, Aon Center, John Hancock Center, AT&T Corporate Center, and Two Prudential Plaza. Walk into any major architectural office and you’ll see plenty of renderings pinned to the wall, showing buildings reaching great heights. It’s just that they’re in Jeddah, Seoul, Abu Dhabi, Beijing — not Chicago. 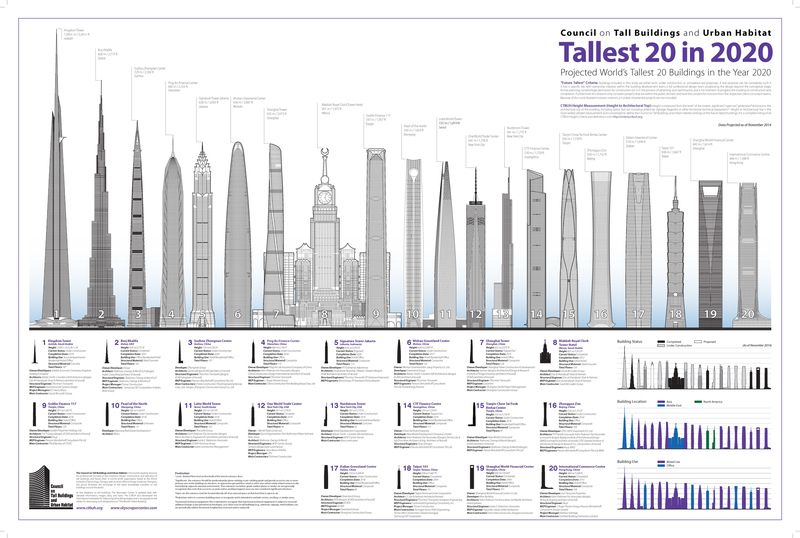 In 2011 CTBUH even had to add a new category of tall building to reflect the explosive growth of tall buildings in recent years; so-called “megatall” buildings stand at least 600 meters (1,968 feet) tall. There are only two complete megatall buildings: the Burj Khalifa in Dubai, and the Royal Hotel Clock Tower in Mecca, Saudi Arabia. When the Shanghai Tower opens in April of 2015, it will be the third, at 632 meters (2,074 feet) tall. Supertalls can be risky investments. (Some economists even think bombastic skyscraper booms are an omen of economic collapse.) But as one developer put it, the profession attracts risk-takers. At the moment the most likely candidate for Chicago’s next supertall is an 88-story, $900 million development proposed for 375 E. Wacker Dr., in the city’s Lakeshore East neighborhood. It would be 1,150 feet (350 meters) tall, and its developers — Beijing-based Dalian Wanda Group and local firm Magellan — hope to have it open in 2018. They’ve hired two local design firms to sculpt the structure, which would become the city’s third tallest building: Studio Gang Architects and bKL Architecture. Lead designer Jeanne Gang’s other notable projects include the Aqua Tower — a high-rise with undulating balconies that mimic wave patterns when viewed from an angle — and the lyrical WMS Boathouses at Clark Park. bKL designed the first tower in the Wolf Point development and a 45-story tower at 200 N. Michigan Ave., both of which are currently under construction. Their preliminary designs for what’s being called Wanda Vista show a cluster of three towers stepping down in height as they go east, each terminating in a green roof. The glassy high-rises, which are expected to house a five-star hotel, for-sale residential units and retail space, look like stacks of frustums, or cut-off pyramid shapes. The middle tower would meet the ground with a soaring glass atrium looking north over the Chicago River, while the structure itself would straddle North Field Boulevard running to the south. So what are its prospect? Although Mayor Rahm Emanuel says there won’t be any public funding involved, the project still needs city approval because its proposed height would exceed the maximum allowed in in the area’s master plan. Arguably more important is the economic challenge. Downtown Chicago is in the middle of a residential and hotel boom that signals high demand, but could mean the market is nearing saturation. Still, Sean Linnane of Magellan Development Group is confident they’ll deliver on this supertall order. Chicago’s market is warming up, but China’s is burning across its borders. Wanda is owned by Wang Jianlin, the richest man in mainland China. Like many Chinese developers, he’s looking for new markets overseas. That explosive growth has gone on for a long time, but lately Chinese home prices have slipped. Tom Kerwin, principal of bKL Architecture, says the U.S. real estate market is a relatively stable place for global developers to invest. Other major Chinese developers such as Greenland Group and ECADI have made their first U.S. moves in New York City and Los Angeles, but Wanda’s debut is in Chicago. That’s a vote of confidence in the city’s real estate market, and it mirrors a larger trend: Between March 2013 and March 2014, the Chinese purchased $22 billion of U.S. residential property — the highest volume for any non-domestic group. Wanda’s not the only Chinese developer interested in Chicago. In 2014 Beijing’s Cinda International Holdings Limited teamed up with Chicago-based Zeller Realty Group to buy the 65-story tower at 311 S. Wacker Dr. for $304 million. That’s the seventh tallest building in Chicago to date, a mere seven meters (23 feet) short of supertall status. If it comes to fruition, the Wanda project could signal a new era of tall building investment in Chicago, says CTBUH Executive Director Antony Wood. What about other recent contenders to be Chicago’s next supertall? In 2013 Chicago City Council approved the first part of an audacious redevelopment plan for the massive Old Main Post Office downtown, which has loomed vacant over the Eisenhower Expressway since 1996. The plans came from British developer Bill Davies’ International Property Developers and local architects Antunovich Associates. They called first for a rehab of the existing 2.7 million square foot post office and the construction of a 1,000-foot tower, to be followed in a later phase by a 2,000-foot tower that would be the tallest in the Western Hemisphere. The first phase would take eight to 10 years, Joe Antunovich said, while the rest might take 20 years. But first they need to secure financing. The entire project could cost $3.5 billion. It would be an impressive feat, to be sure. But in that amount of time, Shanghai’s Pudong district went from mainly farmland to a part of a metropolis with more skyscrapers than New York City. In 2014, however, the project’s developers announced they were exploring alternative plans for the property, possibly nixing the 120-story tower. If you want to see evidence of the recession’s impact on skyscraper construction, you don’t need to pore over spreadsheets or the architectural billings index: You just need to go to 400 N. Lake Shore Dr., where you’ll find a pit about 100 ft. wide and 80 ft. deep. The ill-fated Chicago Spire was supposed to be the tallest building in the western hemisphere. But the twisting 2,000-foot tower failed to attract enough financing and was hit with foreclosure lawsuits. 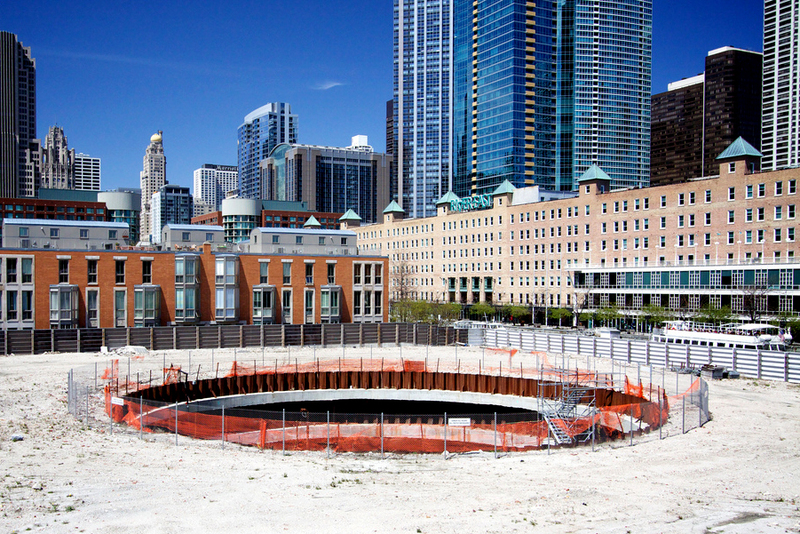 Now it’s the most-watched hole in the ground in Chicago real estate. In 2013 real estate developer Related Cos. of New York reportedly entered talks to buy the Spire&apos;s discounted debt, but in November 2014 a U.S. Bankruptcy Court forced the project’s original developer, Garrett Kelleher, to hand the 2.2-acre site over. Related now controls the real estate and has not yet announced plans for development. There are a few factors behind Asia’s building boom that don’t quite apply to Chicago. For one thing, said Wood, Chicago just doesn’t need to make a statement with its skyline like Kuala Lumpur, Malaysia did when its Petronas Towers unseated Willis Tower as the world’s tallest in 1998. The world gains more than 5 million city dwellers every month, and the U.S. accounts for very little of that urbanization. It’s happening in places like China, where a government plan to move 250 million people into cities by 2025 helps generate huge demand for high-density, supertall buildings. But even if Chicago isn’t home to many new supertalls, it’s still a nerve center of sorts for tall building architecture and engineering. If they pull it off, the Wanda Tower will change the Chicago skyline. But in China huge developments happen all the time. One of the tower’s architects, bKL Principal Tom Kerwin, says China’s economic and demographic booms have made massive projects part of the new urban culture. In addition to moving to Asia, supertall towers have changed since Chicago’s skyline rose decades ago. Tall towers today tend to have more retail and residential space than their counterparts from previous generations. They are often mixed-use — combining hotel, retail, office and/or residential space in one building — and use different structural systems, like concrete-steel composites as opposed to just steel. And rather than bearing corporate names such as Chrysler, Sears and Petronas, they’re increasingly named to inspire civic pride: say, the Russia Tower or Chicago Spire. Burj Khalifa was originally called Burj Dubai. Brian Lee, a design partner at Skidmore, Owings & Merrill — the architectural offices behind thousands of skyscrapers around the world, including four of Chicago’s six supertalls — has seen the effect of these projects first-hand. A supertall with a Chicago character? Our Curious Citizen, Andrew Wambach, raised another interesting question: If skyscrapers are a statement of their city’s character, what should influence the design of Chicago’s next supertall if it actually comes to be? New skyscrapers at Wolf Point, River Point and 150 N. Riverside — three sites abutting the Chicago River at its confluence downtown — feature riverwalk connections and landscaped parks at their bases. Two of them actually have broader shoulders, as it were, than footprints. Landscape architect Ted Wolff said the Wolf Point project was the first where he’d actually heard an architect tell him to expand his landscaping so far it would hem in the lobby. They may not be supertalls by the Council on Tall Buildings’ definition, but projects like these suggest Chicago’s architectural legacy may be as much about Millennium Park as it is about Willis Tower. 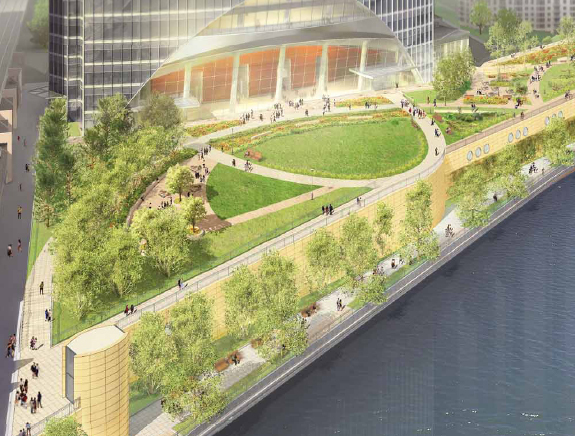 Wanda’s plans for a new supertall in Chicago are still preliminary, but its designers and developers have hinted at connections to neighborhood parks and the Chicago Riverwalk. After all, says architect Tom Kerwin, that’s the critical challenge a design team faces with any new project — no matter its size or location. In other words, to bring the skyscraper down to earth. 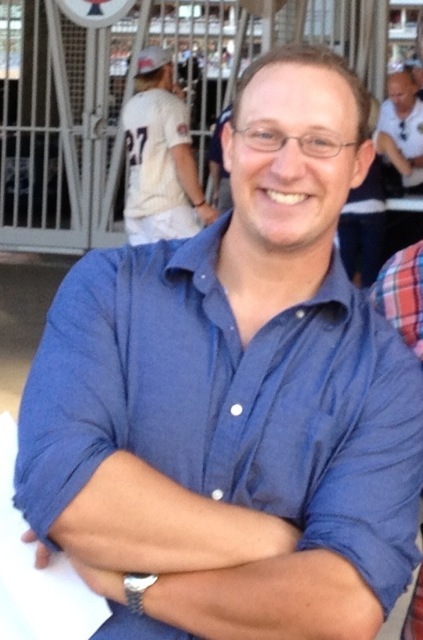 Chris Bentley is a writer with WBEZ and Midwest Editor for The Architect’s Newspaper. Follow him on Twitter at @cementley. Correction: This story misstated the reporting year used for the CTBUH graphic that compares supertalls. The graphic represents data gathered up to November 2014.